The Pittsburgh Steelers went to London destined to make history of one kind and desperate to avoid making another kind of history. The former of course was preordained, the Steelers would play their first regular season game outside of the United States, marking a milestone for one of the NFL’s most storied franchises. The other milestone that would damm the Steelers should they not dodge it was the franchise’s first 0-4 start since the days when Bill Austin called the shots. As Steelers Nation is now so painfully aware, the Steelers now hold an 0-4 mark for the first time since before man set foot on the moon. 0-4 is bad enough, but the root cause of the Steelers record should disquiet anyone wearing Black and Gold. Statistically Speaking the Steelers Played a Good Game, But…. The word on the Steelers heading into London was that, in spite of the 0-3 mark, this was a team that was sticking together. On top of that, things were supposed to be coming together. On top of that they were playing the Vikings, another 0-3 team but one that was playing without its starting quarterback. One win in London would get the Steelers back on the right path going into the bye. If the Steelers could beat the Jets in their first game back, a successful show down at Heinz Field vs. the Ravens would give the franchise a shot at 3-3. But the Steelers got down early and were looking at 34-17 entering the fourth quarter. Yet the Steelers fought back, coming to scoring twice in the fourth quarter and had reached the 6 when time expired. But they failed to get it done. The question is why? Certainly, a couple of members of the Pittsburgh Steelers did put up some impressive numbers. But all of it was for naught, as some other numbers illustrate. All of these numbers are bad. But what’s really worse is that they’re only symptoms of a far deeper problem. An NFL team severely handicaps itself with a minus two turnover differential, but a good teams still find aways to overcome that. Every coach prefers an interception to a pass defensed, but defensing a pass shows that something is going right. Recovering forced fumbles is important, but sometimes that comes down to the randomness of a bounce. None of these numbers, even the sacks and the long gains, are necessarily damming. This was one of Beatrice’s favorite trueisms, and it has applied to the Steelers for three straight weeks. Going three weeks without a turnover and seeing four passes bounce off hands of defenders and a fumble take a wrong roll reveals a team that is actively losing games. Seeing your quarterback dumped twice in the Red Zone happens to teams that are actively losing. The myriad and multiple missed tackles that led to 3 50+ yard games are symptoms of a team that is actively losing. Even when the ball bounced the Steelers way and the Steelers seemingly took advantage, they did it in the wrong way. 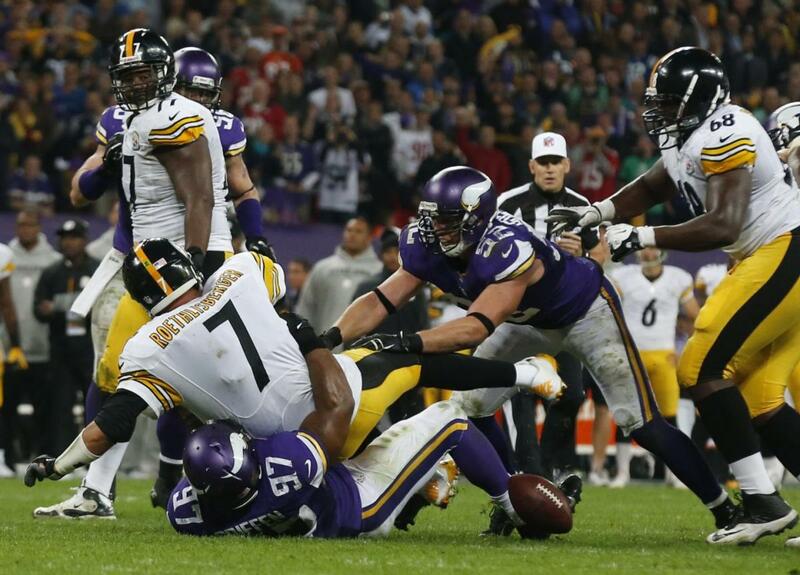 Late in the fourth quarter the Vikings looked to ice the game with a 44 yard field goal. Blair Walsh had already made ones of 54 and 37 yards, so it seemed a sure thing. Walsh missed, leaving the margin at ten. The Steelers took over on downs, got to the Minnesota 12, but after three plays they were forced to kick a field goal. No big deal, the Steelers only needed 10, right…? A touchdown there would have made all of the difference, it would have given momentum to the Steelers and greatly simplified the dynamics behind a second drive. Teams that ‘win’ game score touchdowns in those situations. The Steelers defense got the ball back, but only after Minnesota burned 1:47 – and all of the Pittsburgh’s time outs – off the clock. As it was, the Steelers got to the six where a time out would have made all the difference. The Steelers didn’t have one, and their 2013 record stands 0-4. That’s disturbing. But 0-4 isn’t nearly as disturbing as the reality that in each step it took to arrive there, the Pittsburgh Steelers mastered a new lesson in the art of learning to lose games. This entry was posted in Steelers 2013 season and tagged Antonio Brown, Ben Roethlisberger, Cortez Allen, Heath Miller, Jerrico Cotchery, Le'Veon Bell, Pittsburgh Steelers, Steelers vs. Vikings. Bookmark the permalink. Imagine what the STEELERS record would be with any impact from the defense. No play-makers at all !!! I have to agree with Mr. (Or Mrs.) Anonymous. Forget the fast 20 games. Only 35 in the past 36. I know sometimes turnovers come down to lucky bounces, but when a drought lasts this long, it’s no longer luck. Great stuff and awesome and thorough recap. Wow that took some digging. I think you and Tony are right. When a team goes w/o turnovers for this long, it is no longer simply a question of chance.